The Finnish food safety authority, Evira, has found for the first time live larvae of the Asian long-horned beetle in wooden boxes, which are used as packaging for transporting Chinese stoneware. Photo – Lehtikuva. 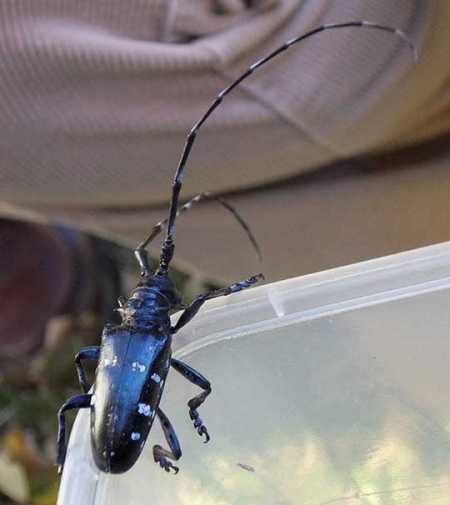 The Finnish food safety authority, Evira, has found for the first time Asian long-horned beetle in wooden boxes used as packaging for transporting Chinese stoneware. The beetles are very destructive to deciduous trees. The large-sized larvae live inside the trunk of the tree, carving out sizeable corridors, causing the branches to wither, and, eventually, the death of the tree. Chinese stoneware importing and processing companies have been asked to observe whether insects are living in their wooden boxes, or of any corridors made in the sawdust. They are to report their findings to Evira. Asian long-horned beetles have known to spread through packaging materials already to Germany, Holland, France, Austria, Italy and England.